- The UltraScan utilises both visible and infrared spectrums to target all types of foreign material and colour defects. 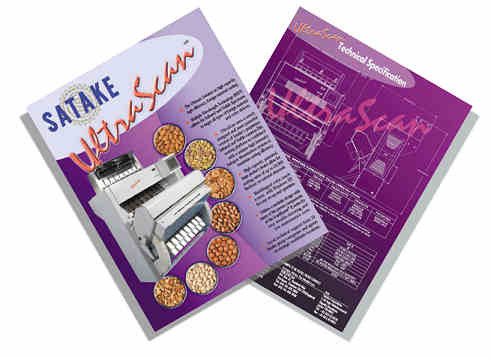 - The UltraScan uses a newly developed and more powerful version of Satake's proprietary Infrared and Visible cameras. 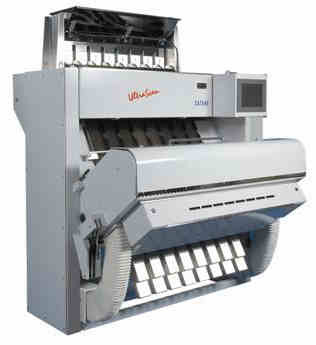 - This sorting platform is combined with a unique high intensity halogen illumination system to maximise sorting efficiency. - High capacity, patented, large product chutes allow for sorting rates of up to 11 tonnes per hour. - Multilingual colour touch screen with Windows XP for easy set up and operation. - Local technical support from 10 Satake group companies and agents in strategic worldwide locations. + Re-sort option capability available where 1, 2 or 3 out of the 8 chutes can be used for simultaneous re-sorting of rejected products from the first pass.